"There are harms associated with overzealous treatment or inappropriate treatment focused on A1C targets," says Dr. Jack Ende, president of the ACP. "And for that reason, this is not the kind of situation where the college could just sit back and ignore things." For people who have already achieved a lower level, "consider de-intensifying treatment," Ende says. "That is, reducing one of the medications, stopping a medication, just allow the A1C to be between 7 and 8." Some studies have shown that people who have aggressively pushed to lower their blood sugar are at somewhat higher risk of premature death. People also suffer from low blood sugar as a result of aggressive treatment. That was the case for Valerie Pennington, a special-needs teacher who lives in Odessa, Mo. She was diagnosed in her mid-40s and put on an aggressive treatment regime. "The nurse at school — because I was going low so much — made me get an alarm clock." Otherwise, she says, she didn't realize when she was about to faint. "At one point, one of the children actually had to save me because I had just zoned out." Pennington also had trouble losing weight because one of the drugs she took for diabetes often leads to weight gain. The upside for her — and it's a big one — is that once she was off that drug, she shed 100 pounds and has been able to keep her blood sugar in the normal range. She says her general-practice doctor wasn't fixated on a particular number for her A1C, "but my ophthalmologist would always check the number because above 6.5 the chances of getting retinopathy grow." People with elevated blood sugar risk more than their vision, says Dr. George Grunberger, who was on the committee that drew up diabetes guidelines for the American College of Endocrinologists and is past president of the American Association of Endocrinologists. "The moment your glucose goes above normal, it's incurring damage to the back of the eye, to kidneys and to nerves, especially in your feet," he says. Grunberger says he is stunned to see the American College of Physicians giving more weight to the risks of low blood sugar than the benefits of keeping it under control. "My concern is this will be a message to many practicing physicians saying, 'Well, don't worry about it so much, because it's OK,' " he says. He is even more surprised by the suggestion to let a patient's blood sugar levels rise if the A1C is below 7 percent. He says that is based on a misinterpretation of old studies conducted for purposes other than setting optimal blood sugar levels. The American Diabetes Association also rejects the ACP's recommendation. "We stand by our guidelines," says Dr. William Cefalu, chief scientific, medical and mission officer of the ADA. Cefalu says, for one thing, the new guidance gives short shrift to a new generation of drugs that are in use to control blood sugar, "and these drugs do have less risk for hypoglycemia [low blood sugar] and some have very favorable effects on body weight and other cardiovascular risk factors." Everyone does agree on one thing: There is no one-size-fits-all solution. "These are recommendations," Ende, the ACP president, says. "Your doctor should make a decision based upon his best information or her best information as well as your particular case." 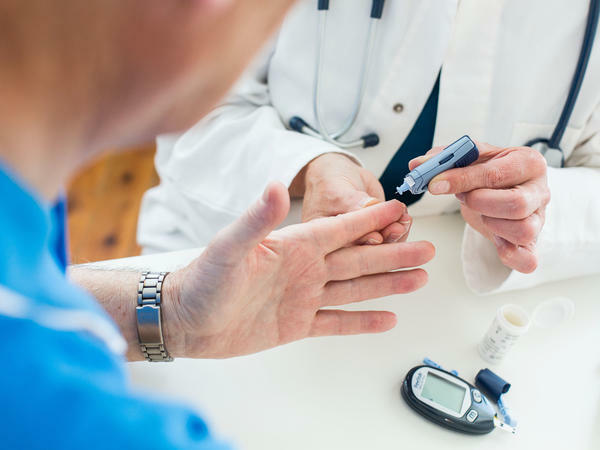 A major medical society is suggesting that doctors who treat people with Type 2 diabetes can set less aggressive blood sugar targets. But medical groups that specialize in diabetes sharply disagree. NPR's Richard Harris has the story. RICHARD HARRIS, BYLINE: Half a dozen medical groups have looked carefully at the best treatment guidance for the 29 million Americans who have Type 2 diabetes and have come up with somewhat differing guidelines. The American College of Physicians has reviewed those guidelines to develop its own advice. Dr. Jack Ende, president of the college, says less stringent goals are appropriate for the key blood sugar test called the A1C. JACK ENDE: There are harms associated with overzealous treatment or inappropriate treatment focused on A1C targets. And for that reason, this is not the kind of situation where the college could just sit back and ignore things. ENDE: Consider deintensifying treatment - that is, reducing one of the medications, stopping a medication. Just allow the A1C to be between seven and eight. HARRIS: Ende is concerned that some studies have shown that people who have aggressively pushed to lower their blood sugar are at somewhat higher risk of death. People also suffer from low blood sugar as a result of aggressive treatment. That was the case for Valerie Pennington, a special needs teacher who lives in Odessa, Mo. She was diagnosed in her mid-40s and put on an aggressive treatment regime. VALERIE PENNINGTON: The nurse at school - because I was going low so much, she made me get an alarm clock 'cause if I didn't eat by a certain time period, then I was going out. At one point, one of the children actually had to save me because I had just zoned out. HARRIS: She also had trouble losing weight because one of her drugs often leads to weight gain. The upside for her - and it's a big one - is that once she was off that drug, she shed 100 pounds, and she's been able to keep her blood sugar in the normal range. She says her doctor wasn't fixated on a particular number for her A1C. PENNINGTON: But my ophthalmologist would always check the number because above 6.5, the chances of getting retinopathy grow. HARRIS: People with elevated blood sugar risk more than their vision, says Dr. George Grunberger, who is on the committee that drew up diabetes guidelines for the American College of Endocrinologists. GEORGE GRUNBERGER: The moment your glucose goes above normal, it's incurring damage to back of the eye, your kidneys and your nerves, especially in your feet. HARRIS: Grunberger is stunned to see the American College of Physicians giving more weight to the risks of low blood sugar than the benefits of keeping it under control. GRUNBERGER: My concern is that will be a message to many practicing physicians - say, well, don't worry about it so much because it's OK.
HARRIS: He's even more surprised by the suggestion to let blood sugar levels rise if the A1C is below 7 percent. He says that's based on a misinterpretation of old studies conducted for purposes other than setting optimal blood sugar levels. The American Diabetes Association also rejects the new suggested guidance. WILLIAM CEFALU: At the ADA, we stand by our guidelines. HARRIS: Dr. William Cefalu is chief scientific and medical officer at the ADA. Cefalu says for one thing, the new guidance gives short shrift to a new generation of drugs that are in use to control blood sugar. CEFALU: And these drugs do have less risk for hypoglycemia. And some have very favorable effects on body weight and other cardiovascular risk factors. HARRIS: On one thing, everyone agrees. Jack Ende from the American College of Physicians says there is no one-size-fits-all solution. ENDE: These are recommendations. Your doctor should make a decision based upon his best information or her best information as well as your particular case. HARRIS: The recommendations are published in the Annals of Internal Medicine. Richard Harris, NPR News. (SOUNDBITE OF RATATAT'S "CHERRY") Transcript provided by NPR, Copyright NPR.